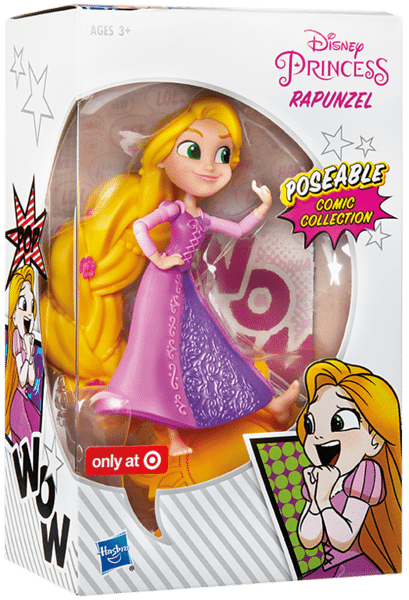 This Fall, Hasbro is set to debut a whole new world of Disney collectibles with the Disney Princess Comics Collection line, a series of posable dolls based upon the Disney Princess comic strip series from Joe Books. The folks at Hasbro were kind enough to send us along two of these magical sets – the ‘Magic Carpet Ride’ set from Aladdin and the ‘Ariel and Friends’ set from The Little Mermaid – while kids (and big kids!) can also expand their collection with Pocahontas, Belle and Rapunzel in order to recreate some of their favourite Disney Princess moments. 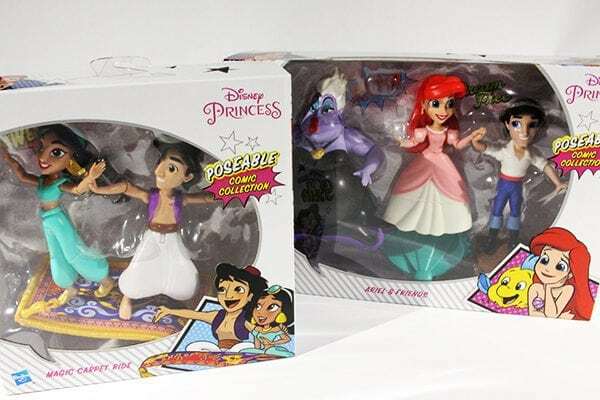 Join JASMINE and ALADDIN on a flight of imagination through the skies of Agrabah with the DISNEY PRINCESS COMICS COLLECTION MAGIC CARPET RIDE set. Little ones can dream up epic adventures as they pretend to soar on a magic carpet ride. 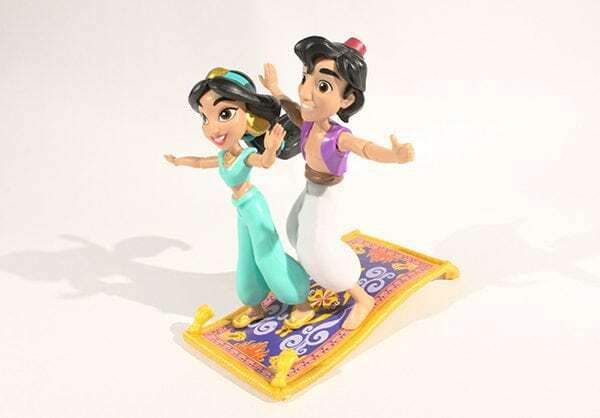 Inspired by the popular DISNEY PRINCESS comic strip series from Joe Books, these 5-inch posable dolls feature six points of articulation and a pretend carpet base, that allow kids to pose their pair for any adventure. 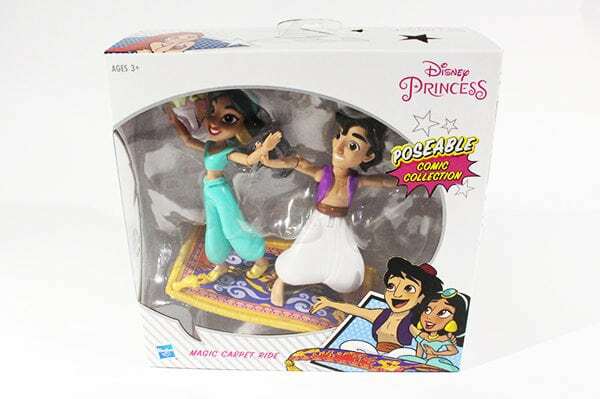 DISNEY PRINCESS COMICS COLLECTION MAGIC CARPET RIDE set comes with ALADDIN and JASMINE dolls and base. 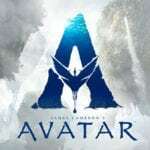 Available at Target stores and Target.com. Disney Princess Comics Collection Ariel and Friends set – $29.99. Littles ones can explore the world above the waves and set out on imaginary adventures on land with the DISNEY PRINCESS COMICS COLLECTION ARIEL AND FRIENDS set. Kids can pretend ARIEL is ready to explore her new surroundings with ERIC, while URSULA tries to stir up trouble for the two. 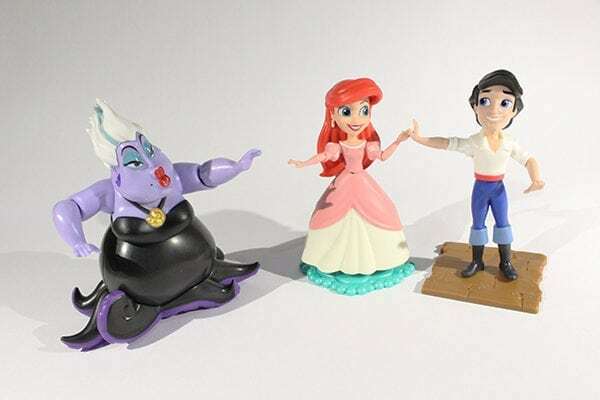 Inspired by the popular DISNEY PRINCESS comic strip series from Joe Books, these 5-inch posable dolls feature six points of articulation and a base, making it easy to pose each figure for the ultimate storytelling. 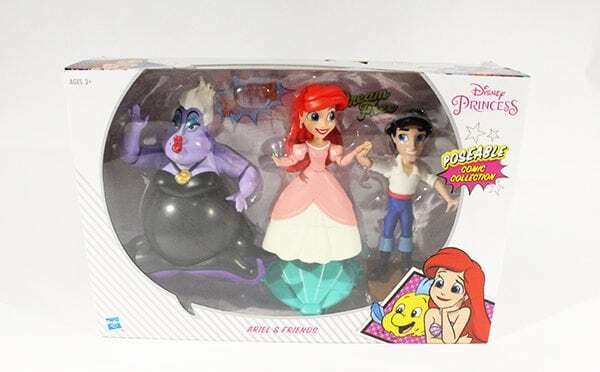 DISNEY PRINCESS COMICS COLLECTION ARIEL AND FRIENDS set comes with ARIEL, ERIC, and URSULA dolls and two bases. Available at Target stores and Target.com. Disney Princess Comics Collection Pocahontas doll – $9.99. Little ones will love to imagine POCOHANTAS paddling down the coursing river or running barefoot through the forest by recreating these adventure moments with the DISNEY PRINCESS COMICS COLLECTION POCAHONTAS doll. 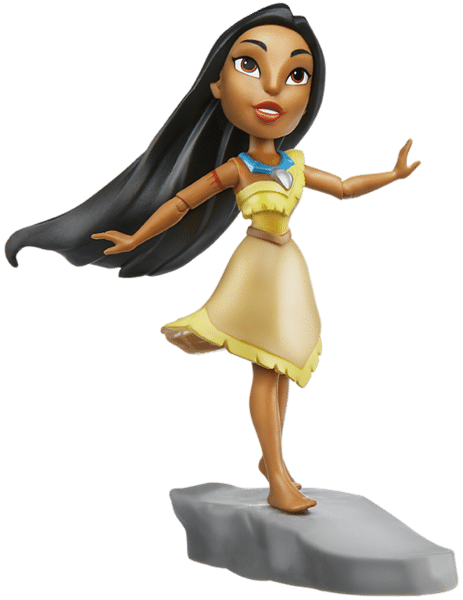 Inspired by the popular DISNEY PRINCESS comic strip series from Joe Books, this 5-inch posable POCAHONTAS doll features six points of articulation allowing kids to act out their favorite moments. Add the doll onto the included base to pose POCAHONTAS for any journey she’s set to take on! DISNEY PRINCESS COMICS COLLECTION POCAHONTAS doll comes with POCAHONTAS doll and base. Available at Target stores and Target.com. 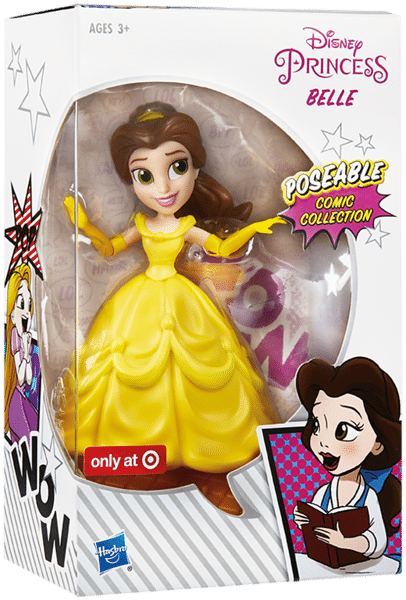 Disney Princess Comics Collection Belle doll – $9.99. Imagine BELLE discovering every corner of her provincial town or exploring the halls of the grand castle by recreating these moments with the DISNEY PRINCESS COMICS COLLECTION BELLE doll. 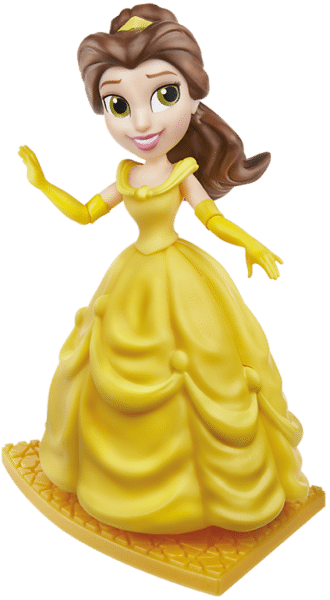 Inspired by the popular DISNEY PRINCESS comic strip series from Joe Books, this 5-inch posable BELLE doll features six points of articulation allowing kids to create imaginary adventures. Add the doll onto the included base to pose BELLE for any journey she’s set to take on! DISNEY PRINCESS COMICS COLLECTION BELLE doll comes with BELLE doll and base. Available at Target stores and Target.com. Take RAPUNZEL on imaginative magical adventures, reaching awesome heights with the DISNEY PRINCESS COMICS COLLECTION RAPUNZEL doll. 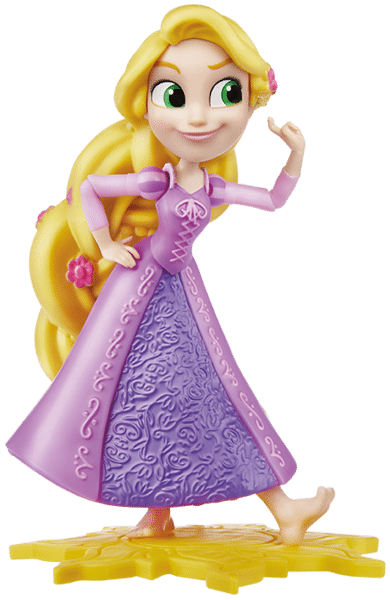 Inspired by the popular DISNEY PRINCESS comic strip series from Joe Books, this 5-inch posable RAPUNZEL doll features six points of articulation allowing kids to act out their favorite imaginary adventures. Add the doll onto the included base to pose RAPUNZEL for any hair-raising journey! DISNEY PRINCESS COMICS COLLECTION RAPUNZEL doll comes with RAPUNZEL doll and base. Available at Target stores and Target.com.